I am living the absolute Einstein experience these days. I don’t know about you, but each time my annual summer holiday draws near, the relativity of time becomes oh so apparent to me: at the office, time seems to go by both ultra-slowly (what? five more days?!) and ultra fast simultaneously (what? so much left to do?!). In-between freak outs and trying to retain composure, there wasn’t much time for any cooking or fancy eating these last weeks (except for the wonderful cook-out at Summer of Supper two weeks ago), let alone coming up with a blog-post from scratch. So before I leave you for my well-deserved and much needed summer vacation, I took to the “Picture Pantry” of food photos I have taken ages ago, way before I started writing brag&butter, and went foraging for something I could maybe add to some quick writing and turn into a last post before I take off for my vacation. Hey! Nothing bad about that: haven’t we all turned pantry staples and preserves into delectable dinners? There you are. 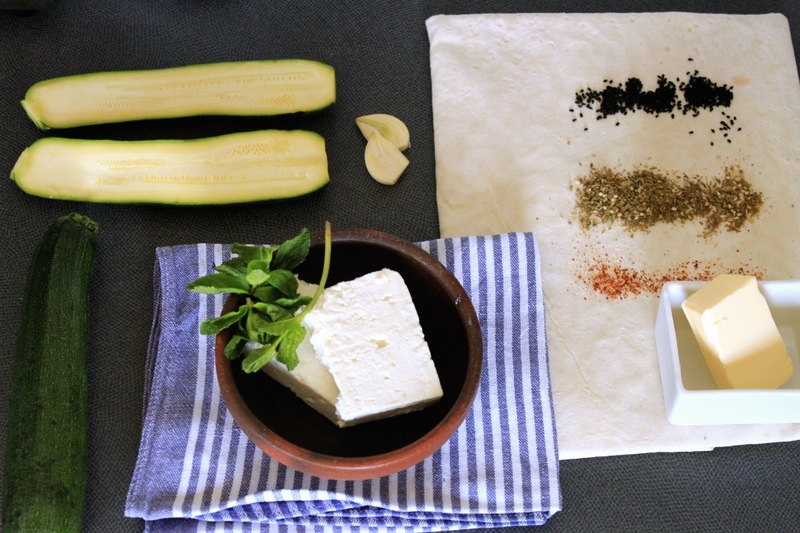 Scrolling through some really bad and some rather good photos of some well-remembered and some long forgotten suppers with friends, I discovered a gem – both because the photos looked decent and it’s a perfect recipe for these summer days: my Zucchini & Feta Yufka is simple, rapid and oh so picknickable. I love everything that is wrapped in pastry or some kind of baked good filled with some delicious surprise. British Pies, Austrian Strudel, Turkish Pide or Yufka, Greek Filo and the like – no matter where they come from: what’s equally great about them is that you have a great meal to start with, but also something to snack on when it’s cold during the following day(s). Especially when time is tight, having something to grab’n’go sitting in the fridge is a comforting thing. Even better is the other case: when you have some time at your hands to enjoy life together with friends and a bite and bottle, having an easily snackable yet satisfying picknick addition really makes the day. And even more so, if it’s done in a heartbeat like the little Christo-inspired number I’m telling you about today. 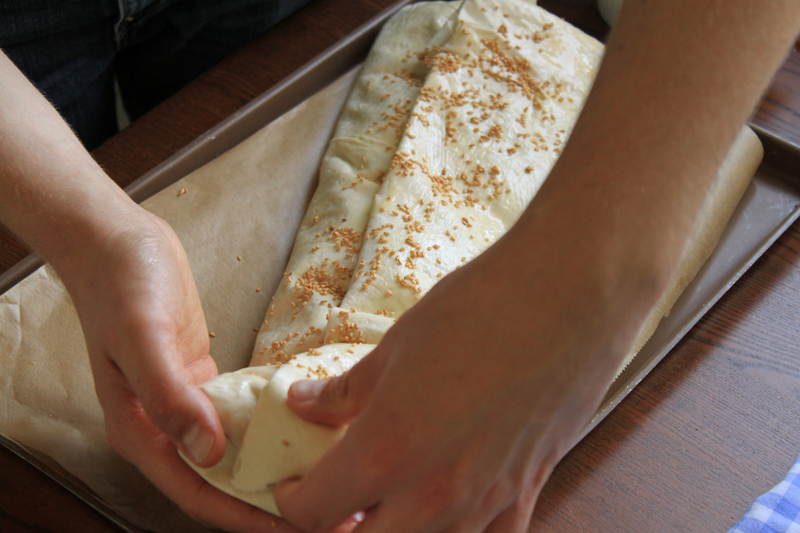 Yufka is, as you may know, a Turkish pastry made only from flour, water, and salt, and baked on hot stones. You can buy it in specialty stores already rolled out and baked, and all you have to do is fill it with whatever you like, drench it in butter, and bake it. I came up with this version of a Yufka when I was in a time crunch (I begin to see a pattern here) the day before my wedding reception two years ago. You heard me. Since I couldn’t imagine having friends and family over at our house without having prepared at least some of the food myself, I took to the kitchen with less than two hours to go before my husband and I left the house to spend the last night out before our big day. Consequently, this recipe is all about speed and shortcuts: invariably everything that goes into the Yufka simply goes over the same grater, is quickly seasoned with Za’atar, spread on the hot buttered pastry and baked. Start to finish: less than 30 minutes. Za’atar is a northern African spice blend of slightly tart sumach, toasted sesame, and the name-giving Za’tar herb which tastes like a the lovechild of oregano and thyme. Together with the salty, almost sharp Feta and the cool mint and zucchini in this Yufka, it’s just as splendid as it is turned into a marinade for some oven baked potato wedges, roast veggies or in your next Köfte. As so often, the super simple and thrown-together things in the kitchen are surprisingly delicious. My friends Julia and Benny were big fans of this Yufka at our reception, and so I redid the recipe for a cookbook they got as a wedding gift. Thanks to Jette for taking the photos back then. And thanks to everyone else, including myself, for eating the finished Yufka before we could get a photo of it. As of tomorrow, I will be on a holiday for the rest of the month, and I am looking forward to seeing you all in September! Have a great summer! 1 Grate the zucchini coarsely and the garlic finely into a bowl. Shred the mint with your hands or scissors into the bowl, and crumble in the feta (you can also grate it). Add the spices, and be careful with the salt. Mix everything well. 2 Preheat the oven to 200 °C top and bottom heat. Spread the Yufka sheets on a kitchen towel and butter generously. Spread the filling in the middle area and fold in the Yufka from the bottom side (this is where you stand), the left and right side and butter every upcoming butterfree-backside. Then roll the whole thing up using the kitchen towel, place on a baking sheet and cover generously in melted butter again. Strew with sesame and bake for about 20 minutes, until the Yufka is golden brown, crisp and crunchy, and the filling begins to ooze out and brown on the baking sheet.